A series of acts of Samsung developing Micro LED has been gradually unveiled. From the rumor about its investment in Taiwan-based Micro LED startup PlayNitride to the recent demonstration of its gigantic Micro LED modular TV The Wall at CES 2018, they more or less suggest Samsung’s attempt to rival other display makers with the Micro LED technology. On January 11, Samsung filed with the Korean Intellectual Property Office two trademark applications, as SamMobile carried in its report. One application is for the 8K QLED TV while the other is for Micro QLED. The Korean display maker showcased its 8K QLED TV at CES 2018; however, it has not revealed any prototype featuring Micro QLED or even the technology itself. Micro QLED is supposed to be different from Micro LED and the 146” Micro LED modular TV, consisting of numerous 9.37” display modules, is therefore not considered related to that new but cryptic display technology. 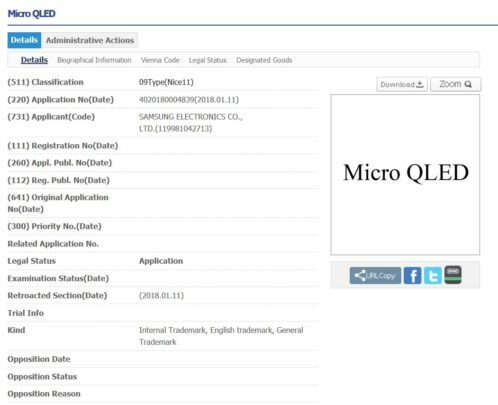 The Micro QLED trademark has sparked speculation that Samsung is possibly going to roll out a new product line of QLED TVs, whereas the application alone does not necessarily mean any applications with the Micro QLED technology now exist or will be released. Samsung might just file the application to secure the name like other companies. A Samsung official said to The Investor that he has never heard about Micro QLED and explained the filing should not be taken too seriously, refusing to further comment on the application.